It is difficult sometimes to have some extra minutes to photograph and write a post about the food I make. Caught between the incredible busy routine and spending some quality time with my kids, there is so little time to dedicate to my passions. Despite of all this, one Sunday, I baked my bread that turned out so spectacular that almost forced me to photograph it. I took the bread out of the oven and brought it in the kitchen to cool it a bit before the photo session. I didn't even finished to organize my props and when returning into the kitchen I found my beautiful bread broken in pieces by my daughter who couldn't resist the smell that was spread around the house. Should I have been upset? My best beautiful piece of bread was gone, so no option to photograph it... but the reason was more noble than a photo on a post: my daughter has devoured the bread and there is no "like" in this world more important for me. As for the bread, in the recent time I only do retarder bread. 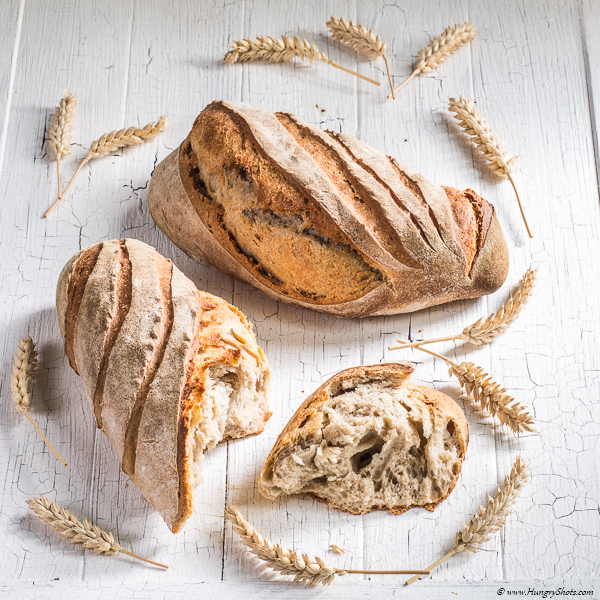 The advantage is that the bread is raising for the first fermentation during the night, and depending on the temperature over the night, I can bake the bread between the morning to the afternoon instead of baking it in the evening if the bread is started in the same day in the morning. This bread is made with a lot of rye. Yes, it has a very sticky dough but the taste is outstanding and as seen, it raised quite nicely. Day 1, 20:30 Mix all ingredients with a standing mixer. Day 1, 21:00 Cover the bowl with a lid and let it stand outside or in the fridge overnight for the first fermentation. These days the nights are cold, so a temperature of 10ºC won't make a big difference from keeping the dough over night in the fridge. Day 2, 07:30AM Bring the dough inside, at room temperature. Let it warm for few hours. Day 2, 11:00 AM Take the dough out of the bowl and shape it in 3 oblong loaves. Day 2, 11:15AM Lay the loaves in floured bannetons and let them raise for the 2nd fermentation, covered with a towel. Day 2, 14:30 Bake in the preheated wood fire oven at 230ºC for 30 minutes. Day 2, 15:00 Take the breads out of the oven and let them cool on a wire rack.